Curt Crews and the Singing Christmas Tree is a Bay Village tradition that keeps making us feel warm and fuzzy at Christmastime. 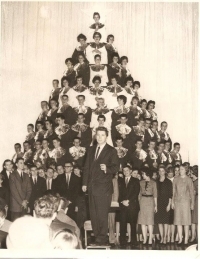 The tree was unveiled in 1959 to oohs and aahs by Curt Crews, Bay High School's choir director. This is a picture of alumni who returned to sing "The Lord Bless You and Keep You" at the end of a Christmas program. Merry Christmas and Happy New Year. A picture is worth a thousand words. So they say. This year, I hope you participate in Christmas with the musical programs offered by our young people by attending the many concerts planned for the community.